The Australian Access Federation (AAF) provides a framework and support infrastructure to facilitate trusted electronic communications and collaboration within and between universities and research institutions in Australia and overseas. The AusNC (Australian National Corpus) supports a single sign-on service enabled by the AAF (the Australian Access Federation) for trusted users. The process is for a user's institutional login credentials to be validated by the institution. The AusNC is then notified of the user's authentication. Specific user attributes, such as name, identifier and affiliation, will be supplied to the AusNC by the institution. Authorisation processes are then enacted, such as determining the level of access rights and permissions to the AusNC, based on the user's role. 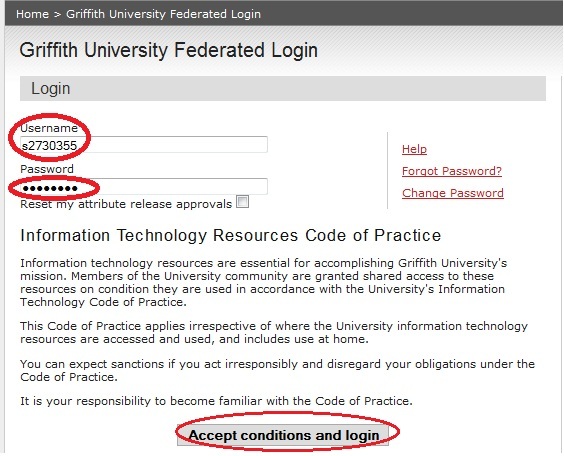 All level of users (except anonymous public access) may login to the AusNC using AAF based authentication. It requires the user to have a valid account with an IdP (Identity Provider) who is registered with the AAF. A user must have user credentials for an institution within the federation and may not be suspended from their institutional systems for any reason. Any user that is no longer affiliated with an AAF recognised institution, or who is suspended from his or her institutional systems, will no longer be allowed access to the AusNC using their original AAF login permissions. Refer to the AAF list of subscribers page to determine if your institution is a member of the AAF. Members of the Research and Education community within Australian and New Zealand that do not have an IdP (Identity Provider), but require privileged access to the AusNC can register to the ARCS Identity Provider Service. 1. Access the Log in link from the AusNC (Australian National Corpus) home page. 2. An AAF log in screen should appear. 3. Select your home institution and log in. 4. Enter your institutional id and password provided by your respective institution. 5. Access to the AusNC will be initiated if the user id and password are valid.